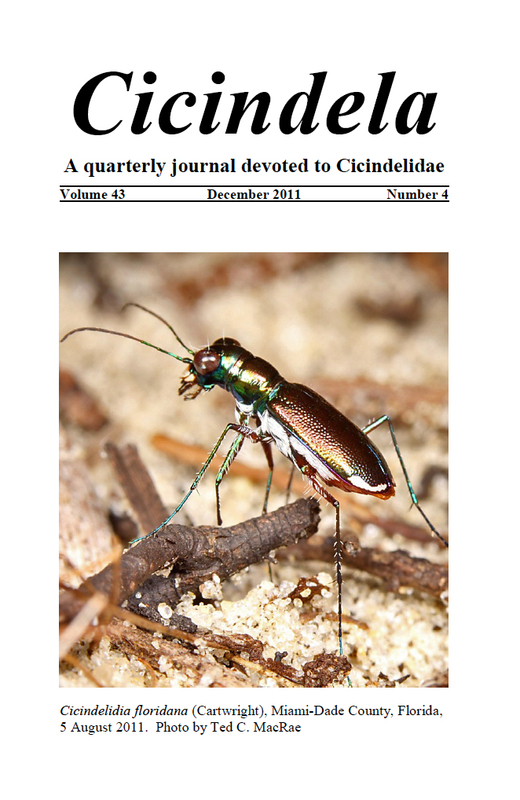 Issue 43(4) of Cicindela (A quarterly journal devoted to Cicindelidae) is now hitting mailboxes (my copy arrived earlier this week), and for the second issue in a row the cover features one of my tiger beetle photos. Gracing the cover this time is the recently rediscovered Cicindelidia floridana, known only from a small area in the Miami metropolitan area of south Florida, and which I was fortunate to have the opportunity to see this past summer. Because the species is regarded as critically imperiled and a likely candidate for listing as an endangered species, the precise whereabouts of its habitat have not been disclosed. So far I am one of only a few people who have had the chance to photograph it in the field. Now, some of you may think that because I serve as Layout Editor for the journal that I can horn in and put one of my own photographs on the cover whenever I want. This is not the case, and it was only because Managing Editor Ron Huber asked me if I had anything for the issue that I supplied the photo after having just done so for the previous issue. In actuality, we encourage others to submit their tiger beetle photographs for consideration, and since a majority of U.S. species have already been featured at some point over the years we especially encourage ex-U.S. photographers to submit their photos so that we can limit repetition. Obviously, C. floridana has never been featured on the cover before now, so it was a no-brainer choice for this issue. The issue contains two delightful papers. The first is another by Mathew Brust on the stunningly gorgeous Cicindela pulchra that discusses not only additional northern range extensions in South Dakota and Wyoming, but also the rediscovery of the species in Nebraska far from the single previously known collection record in the state nearly 100 years ago! It is amazing to me that one of North America’s most conspicuously beautiful tiger beetle species has gone undetected for so long in such a large part of its range. The second paper by Dave Brzoska and Ron Huber is a long overdue biography of tiger beetle icon Norman Rumpp, who in his professional life was a rocket scientist (literally!) and as an avocation became one of North America’s leading authorities on tiger beetles (I am proud to claim ownership of Rumpp’s nearly complete set of The Coleopterists Bulletin). In addition to numerous publications and unpublished reports on tiger beetles in the western U.S., Rumpp described 12 species and subspecies of tiger beetles—including three of the western sand dune endemics that I have featured in recent weeks (Cicindela scutellaris yampae, C. arenicola, and C. albissima). What may not be appreciated is Rumpp’s sense of humor—well, just read the paper and see! This entry was posted in Coleoptera and tagged beetles, entomology, Florida, insects, literature, nature, photography, science, tiger beetles. Bookmark the permalink. Layout Editor or not, your photo makes a great cover shot! The more I look at arthropod close ups like this, the more I am convinced there’s more intelligence behind those eyes than we often give them credit for. I just recently subscribed to Cicindela, so I get to see it in print as well. Tiger beetles so have personality! Glad to hear if a new subscriber to the journal. Congrats on your second cover photo! I love this little guy! Great job Ted!